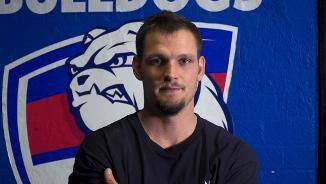 Western Bulldogs forward Clay Smith has announced his retirement from AFL football. 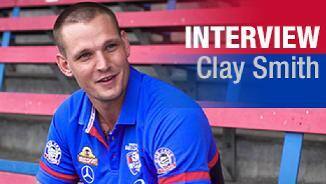 westernbulldogs.com.au reviews Clay Smith's 2017 season. Smith: "Move on and look forward to next year"
Clay Smith turned heads in his debut game with a four goal haul and ability to hit contests with pace, and emerge with the ball. From that game, he has lived up to his reputation of being a fierce competitor. Smith was selected with the Bulldogs first round selection (pick 17 overall) in the 2012 AFL Draft. While injury cruelled his 2013, 2014 and 2015 seasons, 2016 saw him return to action, making an immediate impact. Surving three knee reconstructions, Smith played the last 13 games of the Club's stellar 2016 season, and became a premiership player in the process. Smith was best on ground in the Club's historic preliminary final win, kicking four goals. Smith had 13 disposals and kicked one goal in the Grand Final victory. In his sixth season at VU Whitten Oval, Clay Smith notched his 50th game in 2017. The match was a significant milestone given the 24-year-old has suffered three knee reconstructions during his playing career. Smith, who signed a one-year contract extension with the Club in May, played eight games for the season. In his most dominant display, he put together an impressive four goal-haul against the Tigers in Round 7. A calf injury following the Round 9 loss to Geelong sidelined Smith for three weeks. He came back through the VFL, playing three matches, and was eventually recalled in Round 16 and again in Round 20 before returning to the VFL for the remainder of the season. Smith kicked four goals in Round 7 and was a catalyst to the Bulldogs’ second half revival against the Tigers. “It was awesome to get another year (contract extension). I think my work down forward was a bit better and I was able to get on the end of a few goals this year. “The Richmond game, Bevo put it on me at half time that I wasn’t going as well as I should’ve been. I ended up coming out and kicking four and we got over the line and that was just a game that showed me that I can do it up forward. - Clay Smith, September 2017. Clay Smith is one of the great football stories of 2016. Returning via the VFL from his third knee reconstruction, Smith reminded all and sundry what he was capable of with a dominant 35 disposal, six inside-50 and seven clearance performance in a win over Geelong at VU Whitten Oval. 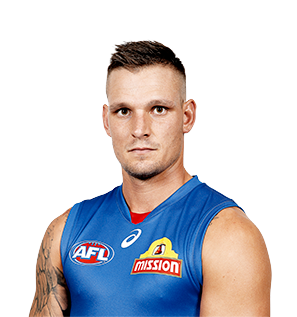 Smith was back in the senior side by round 15 and never looked back, his grunt and goal-kicking prowess a key ingredient in the Bulldogs' finals mix. He kicked four first half goals in a match-winning preliminary finals performance against Greater Western Sydney and laid a record 38 tackles across the Dogs’ four finals, including 11 in the Grand Final against the Swans. With a full pre-season under his belt, the 23-year-old can only get better. Played 15 straight games in his return season, including two at VFL level. “It was nice to finish the year and know I’m going to do a pre-season. I haven’t had that kind of continuity the last three years, so to get 15 games, including the VFL, it’s just good to finish off the year. I picked the right year not to get injured. The tough midfielder endured the highs and lows of AFL football in 2015. 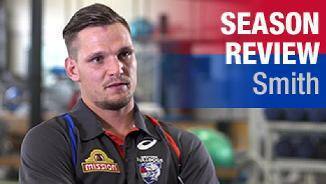 Smith returned from his second knee reconstruction, to play for Footscray in round three. Such was his influence and efforts in the pre-season, Smith got a call up to the senior side after only one VFL game. He returned in round four against Adelaide, and the impact the 22-year-old has on the group was evident as every teammate got to Smith to congratulate him after his first goal. After two successful senior games, Smith unfortunately succumbed to a ruptured ACL in round six, and underwent his third knee reconstruction. Unlucky is the word to sum up Clay Smith’s 2014 season, after rupturing the ACL in his right knee for the second time in 12 months. In positive news for both Smith and the Club, Smith’s signed a contract keeping him at the Bulldogs to the end of the 2016 season. Smith only managed one senior game in 2014 but will be looking to get back to full fitness and return to the senior line-up in 2015 to add to his career games tally of 31. “We feel we are forming a core group of young players with desirable and sound qualities and Clay signing a contract extension is another step in the right direction for our Club. Smith’s second season was punctuated by highs and lows. The tough inside midfielder produced some outstanding efforts, including a 26 disposal, two goal game in an otherwise one-sided affair against West Coast. To complement his already relentless attack on the ball, Smith improved his disposal efficiency from that of his first year, committing fewer clangers and adding a potent goalkicking threat with 10 majors. Unfortunately, an ACL injury to his right knee in round 16 cut short his season. Smith spent most of the Bulldogs’ best and fairest night within the top 10 until the missed games at the end of the season impacted his overall ranking. The 20-year-old has forged a reputation on being no holds barred when it comes to attacking the footy and his form in his final six games proves just that. Averaging over six tackles per game, the ruthless young pup continued to make a physical impact around the ground. He also finished fifth at the club in average physical pressure acts and ninth in total pressure acts. As the season progressed he established himself as a regular contributor through the midfield, taking on more responsibility around the clearances and increasing his tackling pressure as he adjusted to the pace of senior football. After the midseason bye Smith played all bar one game in the senior side. In his inaugural season, Smith produced a number of impressive personal bests in his inaugural season including 23 possessions, nine tackles (on multiple occasions), six marks, four goals, six clearances and five inside 50s. Tough inside left-footer with an insatiable desire to win the ball in the air or on the ground and relentless at the opposition when in possession. Also has the capacity to win contests when outnumbered, which was a feature of his play representing Vic Country in the NAB AFL Under-18 Championships, at which he won All-Australian honours. Had an excellent year with Gippsland Power, averaging 26.3 disposals, 4.5 clearances and 5.4 tackles.